The spiral pathway winds its way to the viewing platform at the top of the Spiral Mound. 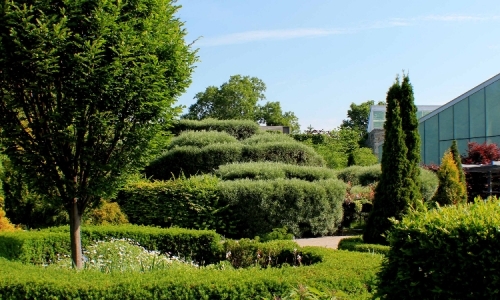 Situated three metres above the ground, the mound is a focal point and provides a 360-degree perspective of the gardens. The grasses that grow on the mound are a blend of hard fescue, chewings fescue and strong creeping red fescue/blue fescue. They stabilize the soil and require only an annual spring mowing to remove dead grass. More recently, Willow shrubs (Salix spp.) have also been planted through out this popular feature of the garden. The grasses that grow on the mound were established through “terraseeding”, a method of blowing a mixture of seeds and soil onto the surface of the mound. The perennial grasses are a blend of hard fescue, chewings fescue and strong creeping red fescue/blue fescue (all Festuca spp.). They stabilize the soil and require only an annual spring mowing to remove dead grass. 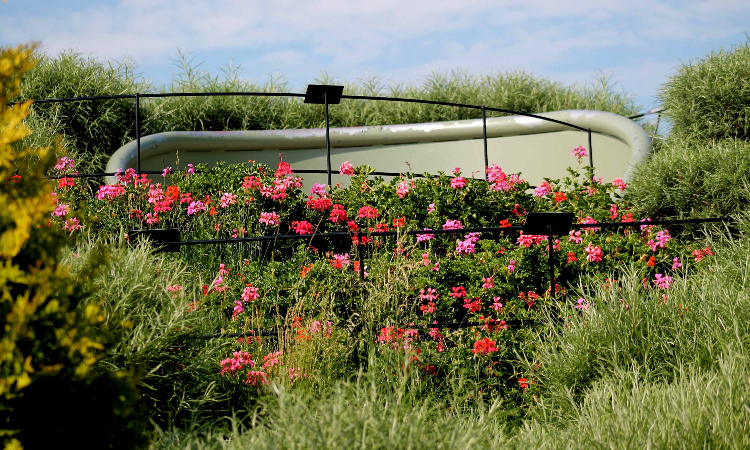 The mound demonstrates sustainable planting options for a steep, well-drained slope in difficult or marginal growing conditions. The Viewing Platform provides the best 360-degree overview of the gardens and is the best view of the patterns in the knot garden.